The structure and composition of the labellar secretory trichomes of Rhetinantha cerifera (Barb. Rodr.) M.A.Blanco were analyzed by scanning electron and light microscopy, as well as histochemistry and chemistry. Histological analyses revealed that the chlorophyllated and dry callus at the basal region of labellum is non-secretory. The white sticky secretion is produced by unicellular secretory trichomes (not papillae), occupying the V-shaped ridge at the apical and median regions of the labellum, and the central portion of the labellar adaxial base, behind the callus. Chemical analyses of dichloromethane extracts of the secretion detected several long carbon chain constituents common in plant waxes (n-alkanes, carboxylic acids, alcohols, esters) and phytosteroids, predominantly cycloartenol derivatives. Histochemical tests showed that the secretion contains terpenoids (oleoresin), free fatty acids, phenolic compounds (including flavonoids), and polysaccharides (mainly mucilage); the results were negative for alkaloids. The secretory unicellular trichomes can concomitantly activate different metabolic pathways, and the exudate should be characterized as “heterogeneous mixtures,” consisting of lipophilic and hydrophilic compounds. Therefore, the labellar secretion is chemically more complex than plant waxes composition. The specific epithet cerifera is thus misleading, and previously reported interpretations regarding the secretion are equivocated. Based on the present results and those from the literature, it is suggested that R. cerifera and R. notylioglossa (Rchb.f.) M.A.Blanco are taxonomical entities that should be merged into a single species, as has been suggested in Flora Brasil 2020 under construction. The first author, SCMV, thanks the UNICAMP (Departamento de Biologia Vegetal) for Histochemical training during Posdoctoral Program, and the USP (Departamento de Botânica) for Biochemical analyses. 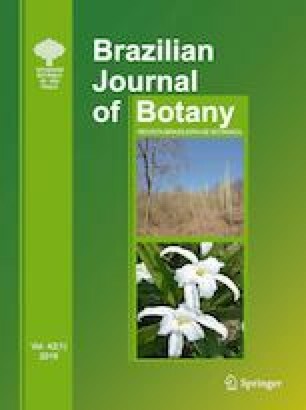 The authors thank the staff of the Structural Botany Section, New York Botanical Garden, for the SEM use. AS is fellow researcher of CNPq (Conselho Nacional do Desenvolvimento Científico e Tecnológico, Brazil. SCMV, PCG, and MMC were involved histological and histochemistry contributions; AS, MLS, and GN were involved biochemical contributions; FB was involved taxonomy contributions.